Description: Two BNSF trains meet at Summit, Cajon Pass. Description: Rainy day visit to Bayside Yard for the 5418. Description: A loaded tac train departs Northtown Yard. Those GEs were working really hard to get the train moving. Description: Welded rail train waits for a signal south of KC Jct. on BNSF's Thayer South Sub. Description: 5418 leads an eastbound autorack train through Calumet City, IL on the IHB. Description: BNSF 7479 Westbound along the Kootenai River a few miles beyond Libby. 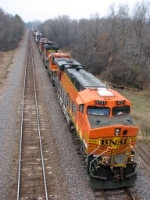 Title: BNSF 5418 heads a WB freight train. Description: heading down the k line into Elsberry mo.